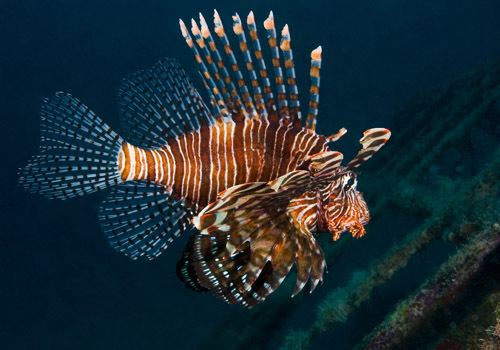 A reef is defined as any underwater structure that poses an obstacle to ships, and a coral reef is therefore technically an underwater obstacle or structure with an associated coral community. 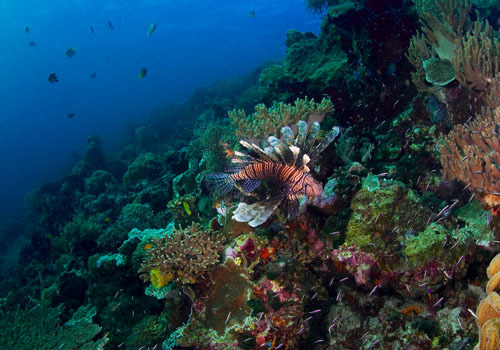 A more ecological definition is that a coral reef is an ecosystem based on an underwater structure created by the calcium carbonate skeletons produced by corals. Corals themselves are marine invertebrates with a similar structure to sea anemones, although they are generally smaller and tend to live in groups called colonies. 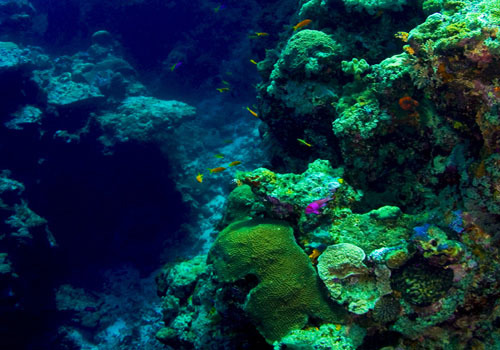 Coral reef ecosystems are found in tropical oceans, as corals require relatively high water temperatures to survive. Corals are an incredibly important group of organisms as they are the ecosystem architects for coral reefs, which are one of the most biodiverse and productive biomes on the planet. The complex 3D structure of a coral reef, which is created almost entirely by the corals themselves, provides a range of habitats to support many thousands of fish species. In turn, these fish support tropical fisheries, which are the major source of protein for around one billion people around the world. However, corals are under severe threat from factors such as climate change, and understanding how they will react to future changes in conditions such as temperature and light are vital if we are to predict how coral reefs will change in the coming decades. Corals can get their energy either through feeding on particles in the water column (heterotrophy) or by using light for photosynthesis (autotrophy). 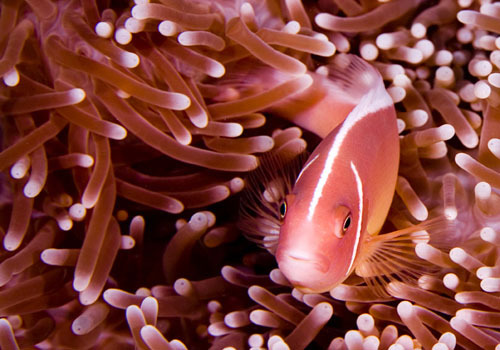 This is because the coral itself is a small animal, similar to a jellyfish or sea anemone, with stinging tentacles that it can use to catch prey and pull it into a small mouth at the centre of the coral. But most corals live in a symbiotic relationship with microscopic single-cell plants called microalgae. The coral provides the microalgae (known as zooxanthellae) with protection and a suitable environment to survive inside their tissue. In return, the coral takes a large portion of the energy which the microalgae produce through photosynthesis. Most corals use both heterotrophy and autotrophy to satisfy their energy requirements. One good example of how they maximise the benefits of this opportunity is when corals pull their tentacles in during the day to allow more light to reach the microalgae, but then extend their tentacles and feed heterotrophically during the night when there is no light available. This ability is particularly important, as the light available in the ocean is incredibly variable, and by changing depth by only a few metres, the quantity and quality of light reaching the coral will change dramatically. The ability to utilise multiple feeding strategies is therefore an important tool in allowing corals to cope with a highly varied environment. Most corals live in groups called colonies, which can be many metres in diameter, although each individual coral polyp is usually less than 1cm in diameter. These colonies come in a range of shapes and sizes, but so do the individual polyps themselves. The polyp sits in a calcium carbonate cup which it creates itself, known as a corallite, and the size of corallites (and therefore polyps) can vary greatly within a single species, in particularly in response to environmental conditions. With light levels expected to change in the coming years as climate change worsens, studying how the size of coral polyps varies between areas of different light levels gives us a valuable insight into how coral morphology will change in the future. One of the easiest ways to estimate polyp size is to measure the density of corallites on the surface of a coral colony. By comparing this between depths, we have a ready made gradient of light levels to compare. Corals can reproduce asexually by budding or sexually by releasing gametes. New coral polyps grow by budding, where a polyp will divide into two new polyps, and this is how a colony grows larger. At certain times polyps also reproduce sexually and produce gametes which are released into the water. These fuse during fertilization to form zygotes which are known as a planula or coral larvae and are dispersed by ocean currents. They eventually settle and, if conditions allow, form new coral colonies. Montastraea cavernosa is a colonial stony coral found in the Caribbean. It can form into large boulders and domes with a 1.5m in diameter in shallow and moderate depths but in deeper waters it tends to form plates or plates. The coral polyps are ‘thumb’ sized when fully extended at night and can be found down to depths of around 30m.